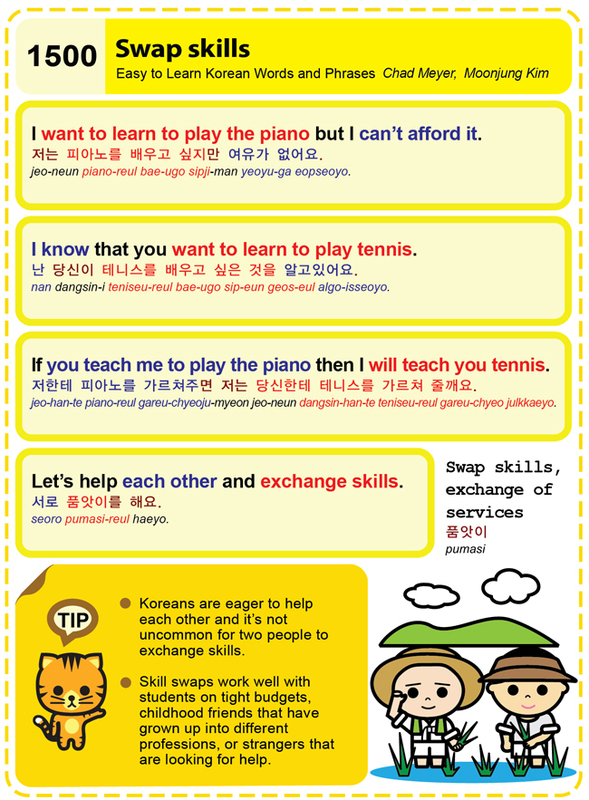 Easy to Learn Korean 1500 – Exchange skills and services. This entry was posted in Series and tagged childhood friends, exchange of services, help each other, I know that you want to learn to play tennis., I want to learn to play the piano but I can’t afford it., If you teach me to play the piano then I will teach you tennis., Let’s help each other and exchange skills., profession, pumasi, skill swap, stranger, Swap skills, tight budget, 난 당신이 테니스를 배우고 싶은 것을 알고있어요., 서로 품앗이를 해요., 저는 피아노를 배우고 싶지만 여유가 없어요., 저한테 피아노를 가르쳐주면 저는 당신한테 테니스를 가르쳐 줄깨요., 품앗이 by easykorean. Bookmark the permalink.